Since the 1960s, Ky Michaelson’s rocket-powered vehicles have set 72 state, national, and international speed records. His penchant for the unknown and passion for speed have been with him since childhood, when he built his first rocket-powered motorcycle. After earning his first world record–for a rocket-powered snowmobile–he decided to go after every acceleration record in the world. This is Ky’s story, the life of a driven–or rocket-powered–man. Ky tells about how he began and where he’s gone, about his work on hundreds of film and television programs, and about his service as program director of “SPACESHOT 2004”–the grand effort of the Civilian Space Exploration Team (CSXT) to build and launch the first amateur rocket into space. And he describes reaching the “impossible dream” as the first amateur to license, and successfully launch, the Go Fast Rocket into space, with an altitude of 72 miles–and a new speed record of 3,420 mph. In 1964, Ky Michaelson built his first rocket-powered motorcycle, propelled by two Turbonique T-16A rocket motors. His success at speed trials on a rocket-powered snowmobile (with a JATO mounted engine) inspired him to smash every acceleration record in the world: to date he has set 72 International and National speed records. This is the story of his life in his own words; a life driven by rocket power. Ky Michaelson tells us why he began and where he has gone: his work on hundreds of TV shows and films, and his development of rocket-power culminating in the successful launch of GoFastRocket, the world’s only civilian rocket launch, with an altitude of 72 miles, and a speed of 3, 420 mph!Along the way, the reader is treated to a dazzling whirlwind of vehicles and devices – a scuba pack adapted for rocket propulsion, tractor seats, wheelchairs, a backpack, hydrogen-peroxide powered racing cars at speed trails on the Salt Flats, and the breaking of record after record by a man regarded as many as the king of modern speed barriers! The innovation that led to each rocket-powered vehicle is shown here, with photographs and design detail for each amazing accomplishment. A famous Country and Western song warns mothers “don’t let your sons grow up to be cowboys. Well, mothers of America, Ky Michaelson’s book Rocketman; My Rocket-Propelled Life and High-Octane Creations should be warning enough. If ever there was a life filled with creation, ambition, purpose and zeal, then Ky Michaelson would fit the description perfectly. Here’s a life cram full of invention, adventure, discovery, friendship, trial, tribulation and creation. 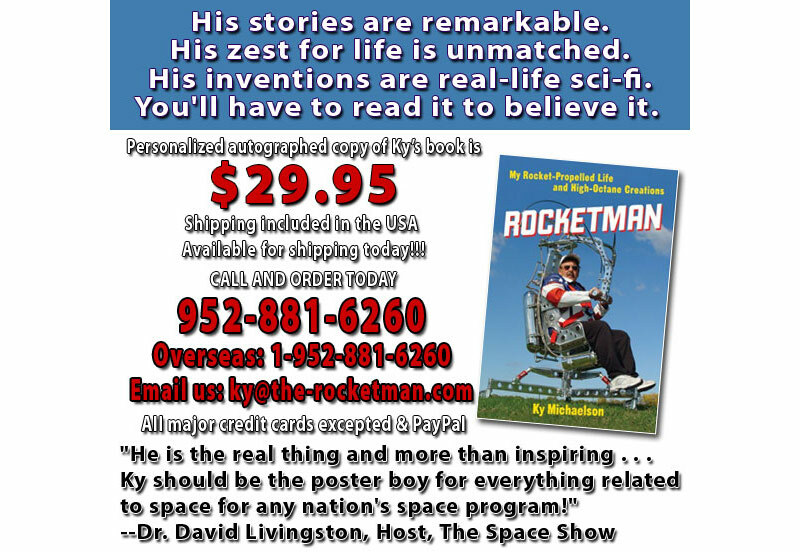 I had heard rumors about the “Rocketman”, more rumor than fact, until Captain Ed Ballinger handed me a copy of the book and asked me to review it. This is a man and his friends who are true hot rodders at heart. Continue the rest of the review by CLICKING HERE. Since the 1960s, Ky Michaelson’s rocket-powered vehicles have set 72 state, national, and international speed records. His penchant for the unknown and passion for speed have been with him since childhood, when he built his first rocket-powered motorcycle. After earning his first world record–for a rocket-powered snowmobile–he decided to go after every acceleration record in the world. This is Ky’s story, the life of a driven–or rocket-powered–man. Ky tells about how he began and where he’s gone, about his work on hundreds of film and television programs, and about his service as program director of “SPACESHOT 2004”–the grand effort of the Civilian Space Exploration Team (CSXT) to build and launch the first amateur rocket into space. And he describes reaching the “impossible dream” as the first amateur to license, and successfully launch, the Go Fast Rocket into space, with an altitude of 72 miles–and a new speed record of 3,420 mph.Ky built an amazing number of rocket powered drag cars that set record after record at drag strips around the country. He built rocket powered snowmobiles, boats and land speed cars. Ky tells the whole fascinating history as only he can– he was there!In part two, Ky takes on a challenge far greater than building record setting land vehicles. He takes the reader step-by-step, hurtle by hurtle, disappointment after disappointment in his drive to be the first civilian to launch a rocked into outer space.As a reader, you feel you are right there with Ky, his wife, Jodi, and his crew, laughing at some of his crazy antics, and feeling your heart sink as the team encounters every sort of stumbling block imaginable. From the design failures of the rocket, dealing with pompous government officials who tried to block the team at every step, to sudden sand storms that delayed or canceled chances to launch, and dirty schemes from another, better funded, competitive team. In the end, Ky’s unbelievable optimism and sear force of determination resulted, finally, in the greatest success of all– the first successful launch of a civilian rocket into outer space. An achievement no other team has managed.Many Viking Chapter members know who Ky is. After reading this book, you will really get to know Ky. This book is a definite must read. If you’re a race fan or a just love rockets you HAVE to buy this book. It’s an easy and fun read. The many pictures make this book an historical archive of rocket powered racing. If you’re not a rocket fanatic you will still want to buy this book. Ky’s story of perseverance is both uplifting and inspiring. It’s a testament to what an impact one person can make by using their raw god-given abilities.